Chica and I just returned from an incredible adventure and I used a new piece of gear that I want to talk about: the ULA Photon Backpack. Our 50-day trip to Europe started on an Amtrak train that shuttled us from central Wisconsin to Chicago. We then flew to Paris where we spent a few days, then off to St. Jean Pied de Port, France by train to start our 500-mile walk of the Camino de Santiago (French Route). 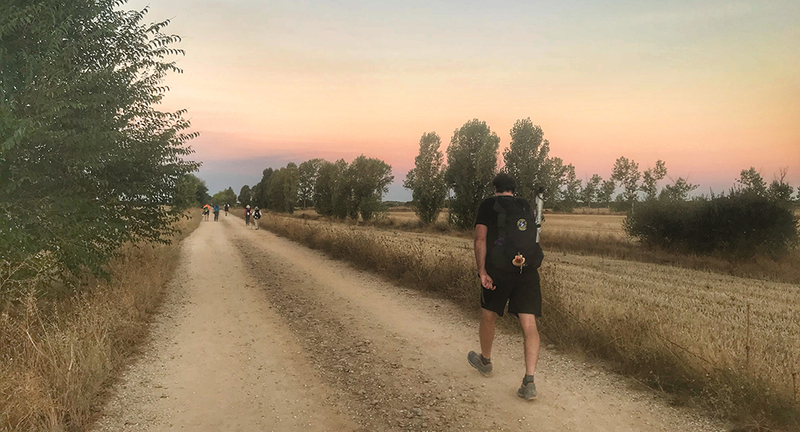 After 34 days of walking we terminated the pilgrimage in Santiago de Compestella, Spain and bused to Finisterre, Spain then back to Santiago where we eventually caught a flight to Madrid to be tourists for a while before reversing course and returning to Wisconsin. 50 days of travel, 500 miles of trekking taking multiple flights, trains, and taxis, but only one piece of luggage for me. 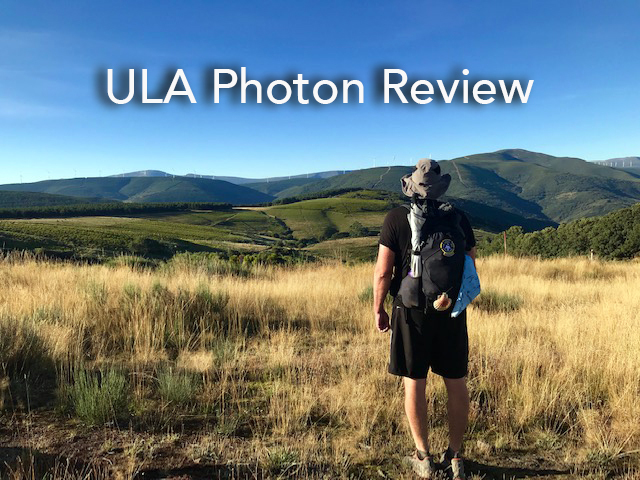 After such a long trip using my new backpack in multiple travel scenarios, I am ready to review the ULA Photon. I’ll start by mentioning why I chose this ULA pack. I searched far and wide for the perfect backpack for this trip. My requirements seemed simple at the time, the backpack needed to fit my 6’3” frame, be of a size that it can be used as carry-on luggage, and have a comfy hip-belt with pockets. 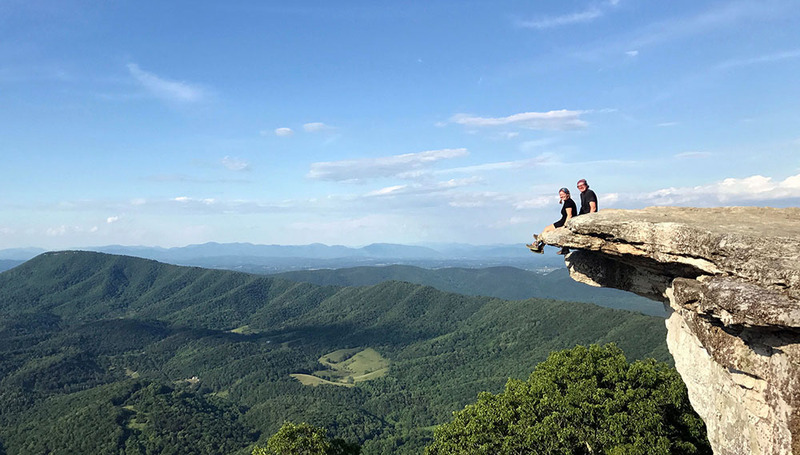 Thru-hiking the Appalachian Trail taught us many things about packing efficiently for an extended trip. I took this experience to inform my decisions on backpack solutions for this trip. However, instead of needing to carry everything to live for four or five days on my back, for this trip I was only required to carry (basically) clothes. No need for a tent, water filtration, food, or a sleep system. Instead, I just needed room for clothing, raingear, and maybe a bottle of wine. In the end, what I was looking for was a daypack. I don’t know if most day-hikers are short or what, but finding a daypack for my long torso was challenging. In fact, ULA was one of the only companies that could customize this size backpack to fit moi. Added to that, most daypacks have a simple strap as a hip-belt and lack pockets. Pockets allow for easy reach of items used most frequently, namely snacks and sunscreen. Finally, and oddly, daypacks that fit the first two needs rarely were of a shape that fit domestic and international carry-on requirements. The Photon is available in 5 different colors including black, green, and orange as seen below. 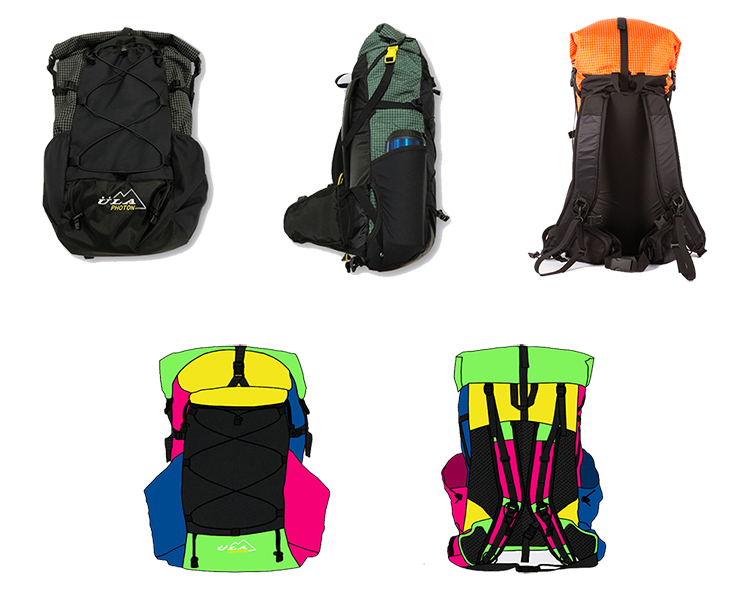 Or, if you want to flaunt your individuality, pay a bit more and completely customize any ULA pack. The Photon’s actual weight was less important than the amount it could comfortably carry, although at between 27 and 28 ounces the pack is light. The volume capacity is 35 liters with a maximum recommended weight of 18 pounds. My base weight was 14.5 pounds. Since we were eating at cafes along the route the only other thing I carried was 1 liter of water. So my total carry weight was ~16.5 pounds, well within the pack’s capacity. If you have read my AT Thru Gear List you know that I was not happy with the Gossamer Gear Mariposa. It caused me shoulder pain and it was a complaint I heard from other tall people on the trail. 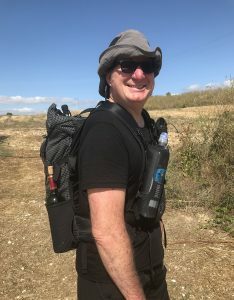 Obviously, I was carrying about half the weight on our Camino trip as I did on the AT, but the Photon felt very comfortable even on 20+ mile days. Not once did I experience discomfort from the pack. The pack comes with two water bottle holsters as well as two side-pockets that can store a Nalgene size bottle. Those that follow us know that we are huge fans of Justin’s UL water holders so I removed the supplied bottle holsters and utilized the side pockets for other items. Since I was using the side pockets for something other than their intended purpose I did experience a minor inconvenience. The water bottle pockets have an opening at the bottom to allow easier retrieval and return of bottles. I was stuffing these pockets with other things, some of which would fall out of the holes at the bottom of the pocket. I eventually figured my optimal set-up for the pockets. The left side housed my umbrella (held down with the side compression strap) and my crushable sun-hat. The right side pocket housed my rain parka — except, of course, in this picture where I used the pocket to house wine for lunch. The sun hat and parka take up enough space so as not to fall out of the hole. The rain cover, which was what kept falling out, was moved elsewhere. The only other quibble I have is in regards to the mesh pouch on the front of the pack. It’s a great place to store wet items or things that might be too messy to put inside the pack. I used it for my sandals, cooling towel, and rain cover. The problem is the pouch tapers too much such that the opening is not wide enough to get things into it. Granted, I have big feet and I was trying to wedge my clunky Xero’s in there, but still I believe there is room for improvement there. Even with all gear taken out of the main pack, accessing the pouch could be challenging. I am not kind to backpacks. I throw them down, I don’t use the carry loop, and I am not cognizant of brushing up against branches or bricks or other abrasive things. Still, after 50 days and 500 miles of abuse my pack looks brand new … it might not smell brand new, but it looks it. We traveled on trains, in Ubers and taxis, on big jets and puddle-jumpers and the pack came on board with me every time fitting easily into the overhead compartment. On flights, if not for my umbrella, I could have even shoved the pack under the seat in front of me. The ULA Photon was the perfect fit for this trip and it will be my choice anytime I travel (Costa Rica is up next) or do a hut to hut type hike. Oh, one last thing, ULA’s customer support is PHENOMINAL. When I was trying to determine which pack to buy for this trip Chris was Johnny on the Spot, answering multiple emails within hours of my hitting send. You just don’t find that level of support anymore these days and it is appreciated.